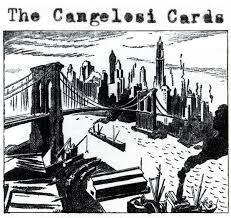 The Cangelosi Cards were a jazz band active from 2006 – 2011 based in New York City. They're great, but I haven't been able to find a copy of their albums. If, like me, you'd like to hear their music, this page lists all their recordings I could find on the public internet, excluding content on YouTube. If any links are broken, or if I've missed something, let me know! Released in July 2009, "Clinton Street Recordings" was the Cards' debut CD (review by Michael Steinman). Formerly available from La Compañía de Músicos Viajeros, you may be able to purchase a copy from Tamar Korn. Two videos by Dabe Murphy of the Cards performing at Banjo Jim's in NYC, December 2009. Includes a the last minute of "I Can't Give You Anything But Love" as well as a full performance of "Bill Bailey". There's also a recording on Vimeo of "Comes Loves" from late 2011 but it has some unfortunate clipping. Clip on Facebook by George Yi of the Cards playing "I'll See You In My Dreams" at Miracle Bar & Grill on New Year's Eve 2009. Four tracks recorded by Eli Smith of Down Home Radio in mid-2007 at Banjo Jim's. An interview on Down Home Radio with Jake Sanders is also available with a recording of "Milenberg Joys" starting about three minutes in and running about six minutes.